The study, published Jan. 18 in Science Translational Medicine, shows that the injectable peptide may more strongly suppress abnormal blood vessel growth and leakage in the eye, cause regression of established abnormal vessels, and may last longer when compared to current treatments. If proven effective in humans, this could mean that patients need only a few needle injections to the eye per year, instead of the monthly injections that are the current standard of care. Aflibercept is the standard treatment for these retinal diseases and specifically targets one protein, vascular endothelial growth factor (VEGF), which signals for the production of these new problematic blood vessels. Treatments are administered by injecting drugs that bind VEGF directly into the eye. “The production of VEGF is chronic, so repeated injections every four to six weeks is needed in most patients, often indefinitely,” says Peter Campochiaro, M.D., the George S. and Dolores D. Eccles Professor of Ophthalmology at the Johns Hopkins University School of Medicine. Using animal models of human disease, the researchers tested whether the peptide, named AXT107 after its discovery in the laboratory of Aleksander S. Popel, Ph.D., professor of biomedical engineering at the Johns Hopkins University School of Medicine, was more effective at suppressing vascularization than currently used treatments. To do this, researchers ruptured tissues at the back of mice’s eyes to induce vascular growth. The mice were then separated into four treatment groups. One received the AXT107 peptide, another received aflibercept, a third control group received an inactive peptide, and a fourth group received both AXT107 and aflibercept. The researchers found that the AXT107 peptide and aflibercept significantly suppressed new vessel growth, and the combination of AXT107 and aflibercept caused significantly more suppression than either alone. In another experiment, mice had laser-induced rupture of tissue and then no treatment for seven days, allowing new vessels to grow. The baseline area of new vessels was measured in one group, and other mice were treated with AXT107 or a control peptide. One week later, the area of new vessels was observed to be less in AXT107-treated mice compared to those treated with control peptide and less than the baseline area measured at day seven, indicating that treatment with AXT107 between days seven and 14 caused regression of already established new vessels. The research team then proceeded to test the peptide in rabbit models of human disease, which are structurally more similar to human eyes, to see whether AXT107 treatment could outlast the effects of aflibercept. The rabbits were divided into three groups: one group received the peptide treatment, another received aflibercept and one received a control. Thirty days after treatment, vascular leakage was reduced by 86 percent in the rabbits treated with AXT107 and 69 percent in rabbits treated with aflibercept, when compared to controls. Sixty days after treatment, AXT107 treated rabbits showed 70 percent less leaking than control rabbits, while the aflibercept-treated rabbits had about as much leaking as the controls. 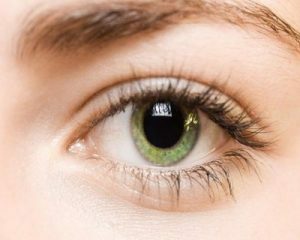 The reason for AXT107’s longevity is its interactions once inside of the eye, the researchers say. They found that when in the fluid of the eye, the peptides naturally aggregated to form a small, gel-like depot, a structure that keeps the peptide inside the eye for longer. “The peptide self-assembles into an aggregate and then slowly disassembles to provide sustained delivery of the peptide,” says Campochiaro. The researchers now plan to investigate delivery mechanisms and the safety of the peptide for humans. The researchers believe the peptide could be encapsulated into biodegradable microparticles, which could release the drug in a controlled manner, extending efficacy of a single treatment to many months. Age-related macular degeneration and diabetic retinopathy are the two leading causes of vision loss in the U.S. — 1.6 million Americans 50 and older are currently affected by vision impairment related to age-related macular degeneration, and 5.3 million people 18 and older have some form of diabetic retinopathy, according to the Centers for Disease Control and Prevention.